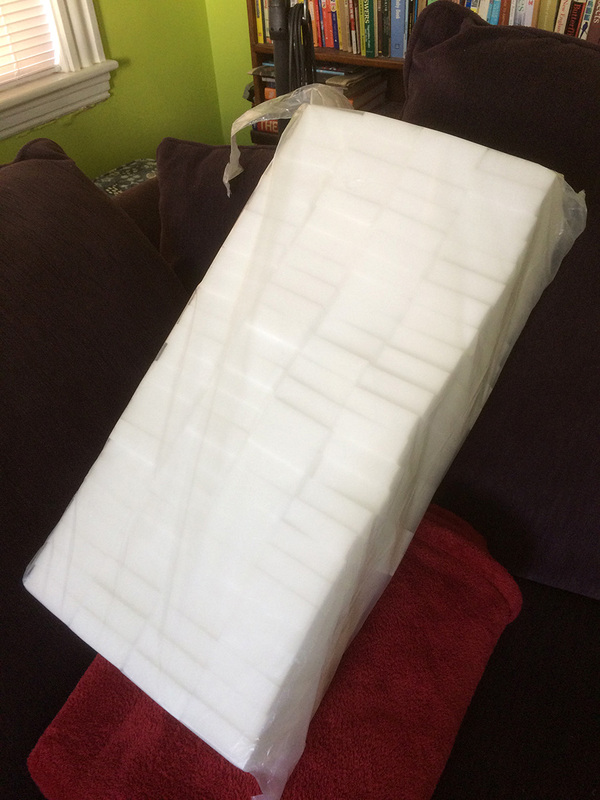 i ended up finding a US-based ebay seller who sold 36-cell flexible panels. 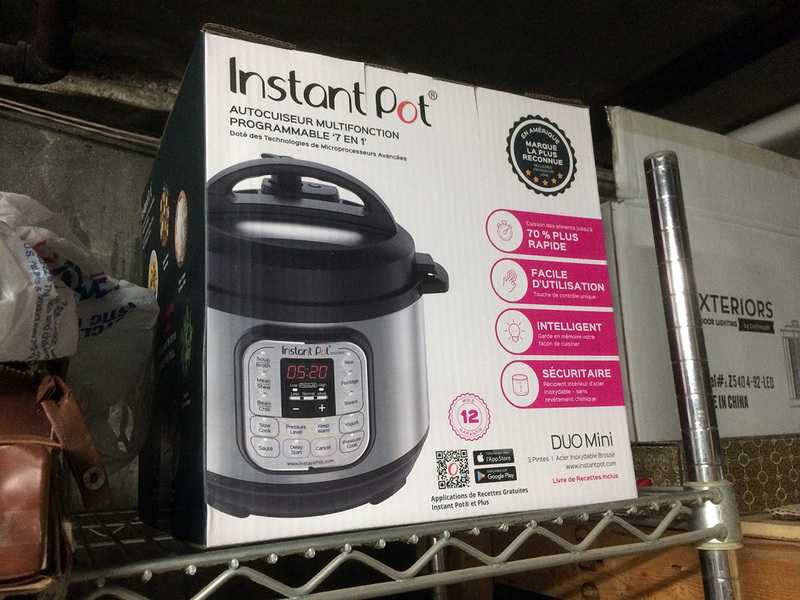 it took some sleuthing to track down as the number of cells wasn't advertised in the listing title, just in the description and the product images. the product images weren't the greatest either, bad photoshop job that made it look like the cells were free floating (it's hard to magic wand white on white). it cost a few dollars more ($114) but it's worth it not having to wait months for it to arrive. 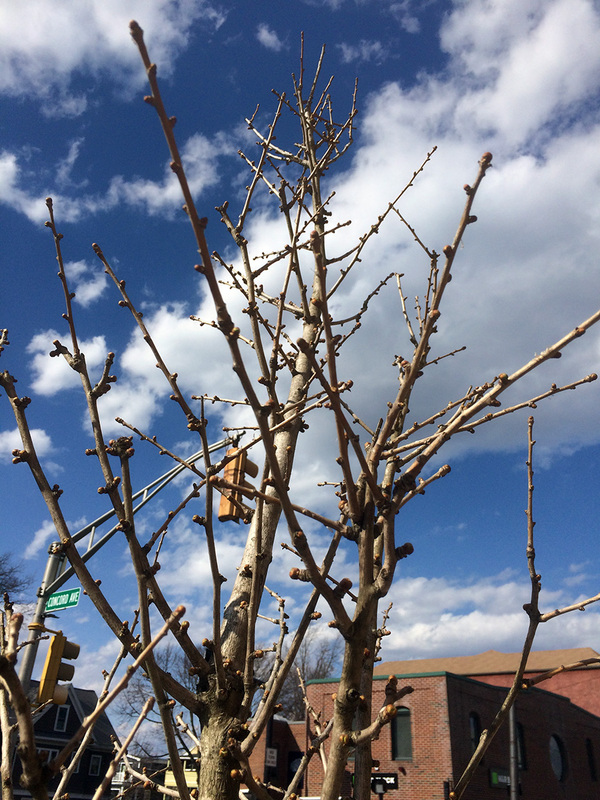 it will get here as early as the middle of next week. i even used some saved up ebay bucks, shaved a few dollars off of the total. 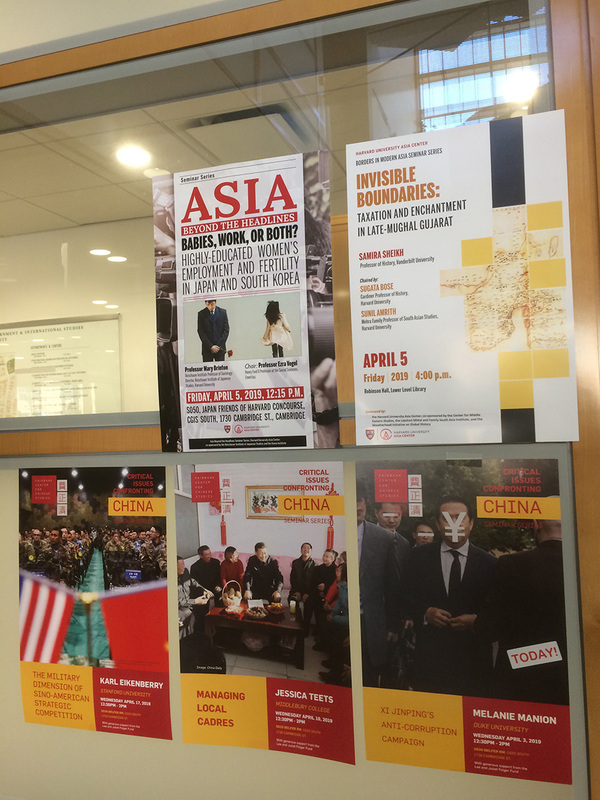 after a vanilla greek yogurt for lunch, i went to a 12:30pm harvard lecture at CGIS south titled, "xi jinping's anti-corruption campaign" by melanie manion of duke university. it was an interesting talk, about how the central discipline inspection commission (CDIC) has extra-judicial powers to investigate corruption within the government. inspectors used to be appointment by local government, which created conflicts of interests when you're investigating the same person who hired you, but now inspectors are appointed from the top, independent from local influences. there are also roving groups of inspectors selected from the upper echelon of government who perform spot checks, to make sure the appointed inspectors are doing their jobs correctly. typically an economy is hurt by corruption but in this case the anti-corruption campaign has actually hurting the economy because officials are less likely to take economic risks for fear of being branded corrupt. manion also agreed that the campaign is just a cover for xi to get rid of his political enemies, but she spoke delicately (since she probably wants to return to china) and said "maybe yes." nevertheless, she was bold enough to later say that the anti-corruption campaign may in fact be a long-sustained purge. she was also focused on how officials higher up choose to fill these job vacancies and may choose people they have no connections with to not give any appearance of guanxi. but something i thought of and brought up by somebody in the audience was in filling these new positions these hiring officials are creating new networks that may not matter now but will be important in the future, those sowing the seeds of new factions. after the talk i biked back home. my father had called me earlier, asking for my help to move some freezers in the basement to allow the plumber to get access to a broken drainage pipe under the cement floor. i packed up my sweet potato pecan pie in a box stuffed with rolled up newspaper and left for the cafe. 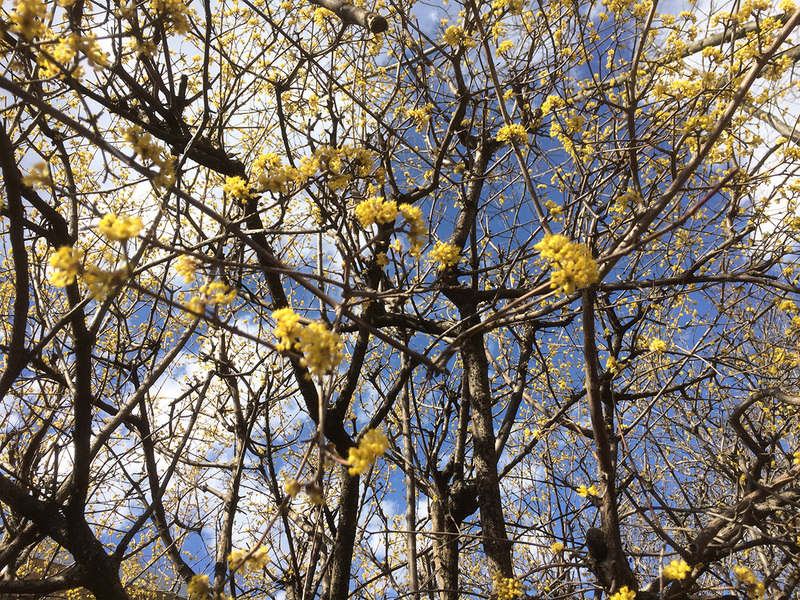 it was warm enough that i just wore a shirt without a jacket. both my parents tried a slice, my mother was surprised it wasn't as sweet as she thought because i said it was a pecan pie. 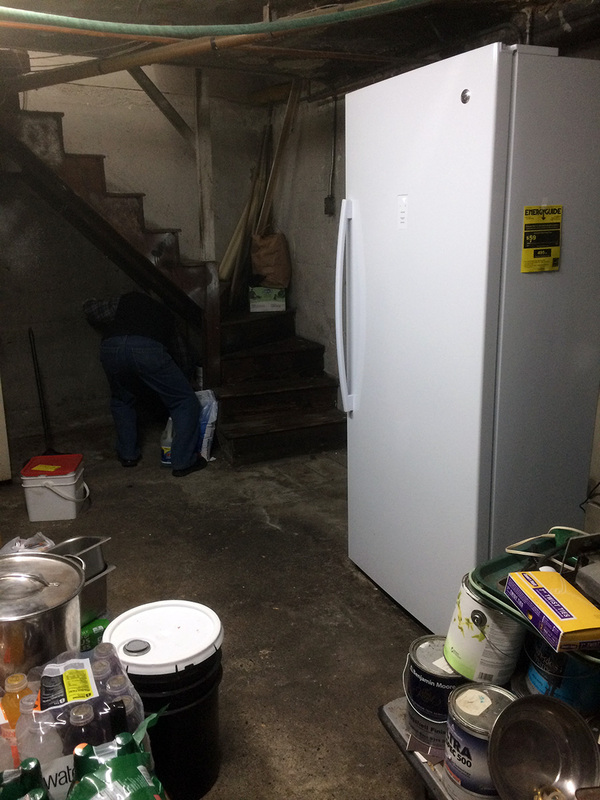 i helped my father move the chest freezer and the upright freezer before returning home. my e-mail to my united solar agent went unanswered on monday so i wrote them back again. 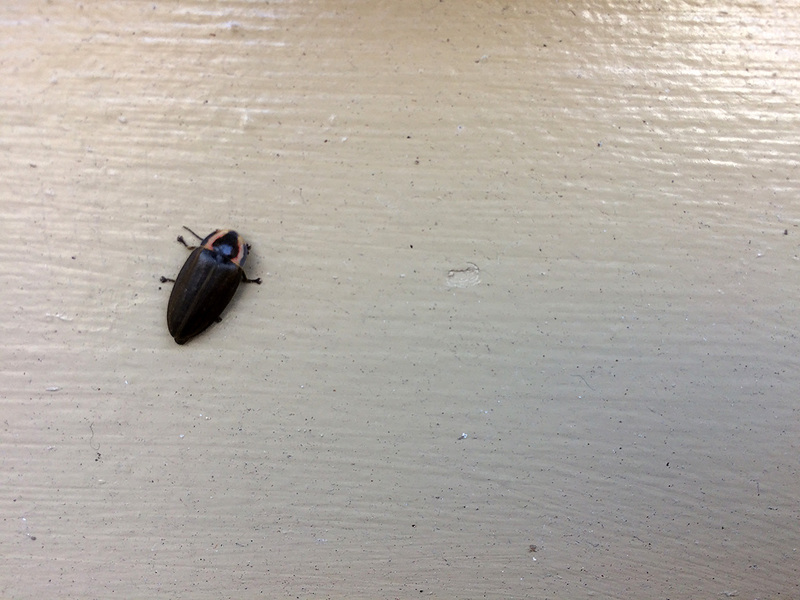 i don't want to be a pest, but i think replacing an inverter that they improperly installed isn't high on their list of priorities so it's my job to keep on reminding them until they do. 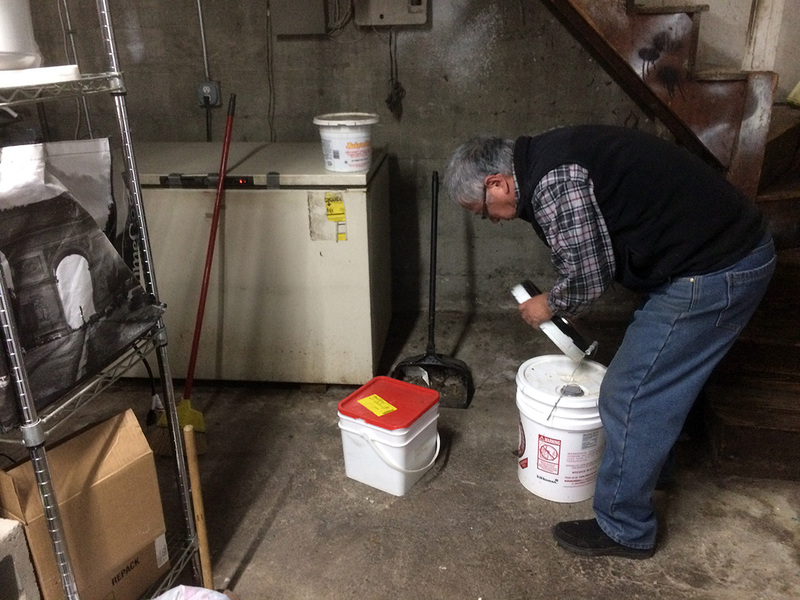 i wasn't expecting much but was surprised when phung wrote back, cc'ing me on a e-mail she sent to project manager kevin asking him to let me know when they were planning on replacing our inverter. so i took that as a personal victory, that we are one step closer to a solution. it's been a while since i used the bread machine. 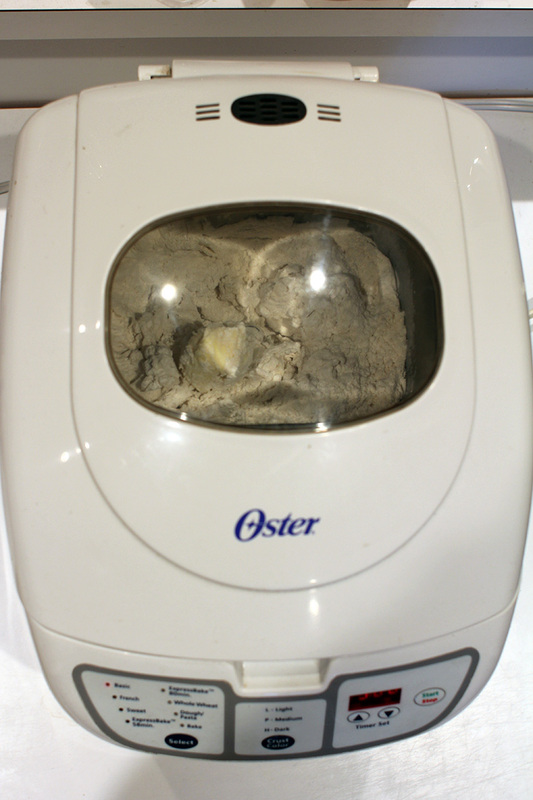 there was a golden age of machine breadmaking in 2007, but i haven't really used it since. 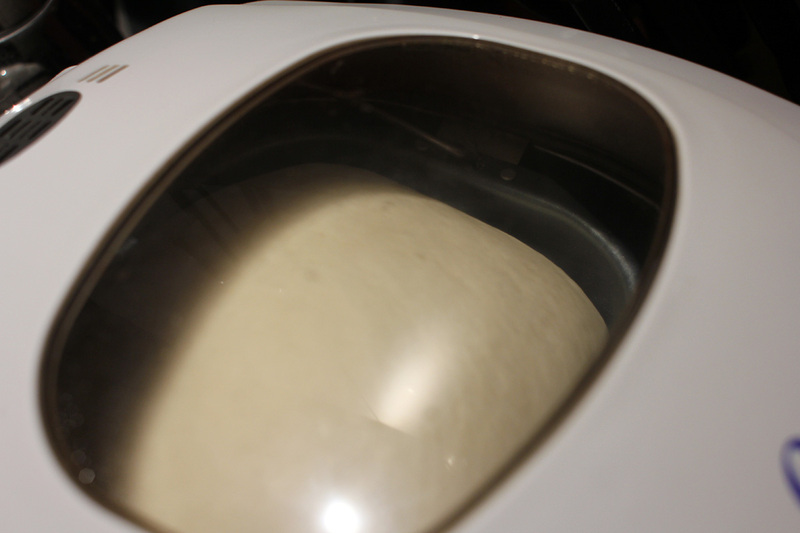 the final time was probably march 2008, when i used the machine to make a whole wheat maple syrup dough for a spicy anchovy pizza. one reason for "retiring" the bread machine is discovering a no-knead bread recipe i can easily make in a cast iron pot in the oven. that is now my preferred method of creating homemade bread, even though it takes longer than the machine. 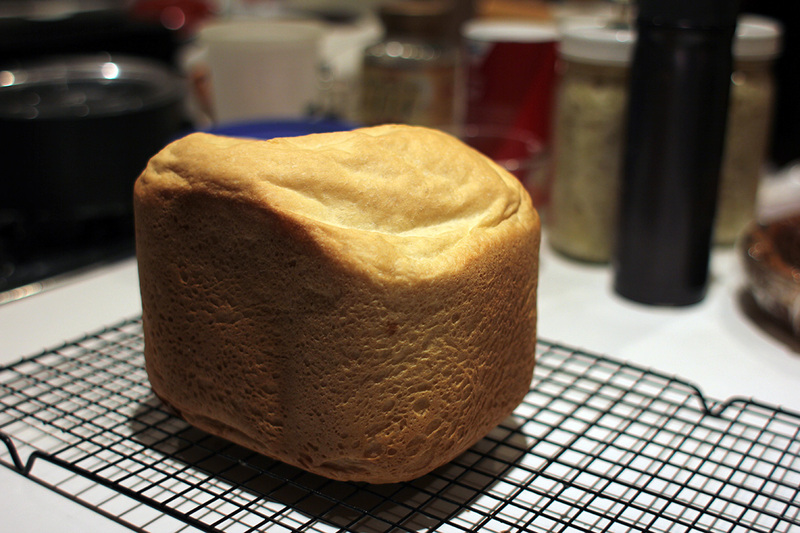 no-knead bread is simply more delicious and visually appealing than the cube-shaped loaves i get with the machine. add ingredients in order. 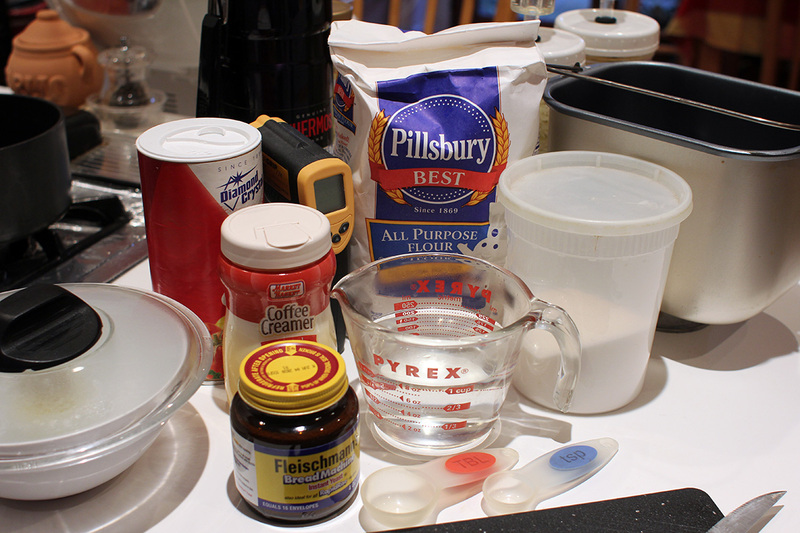 don't mix yeast with liquid beforehand. 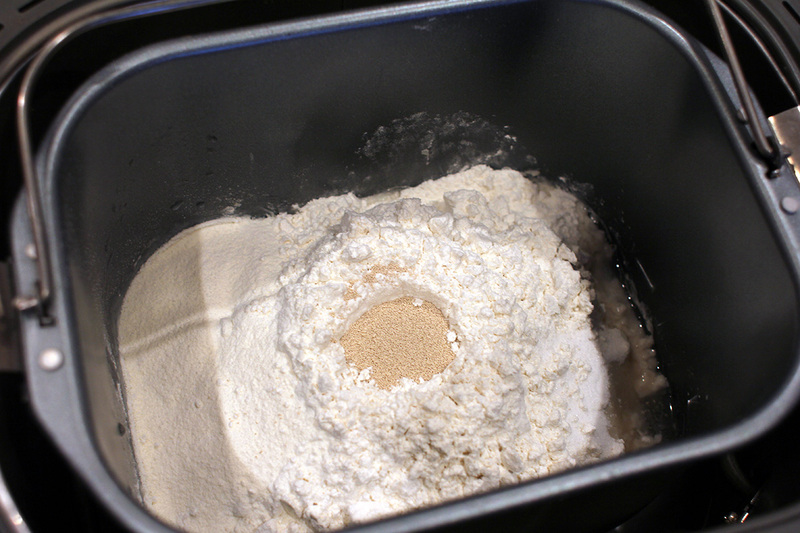 form well to add yeast. 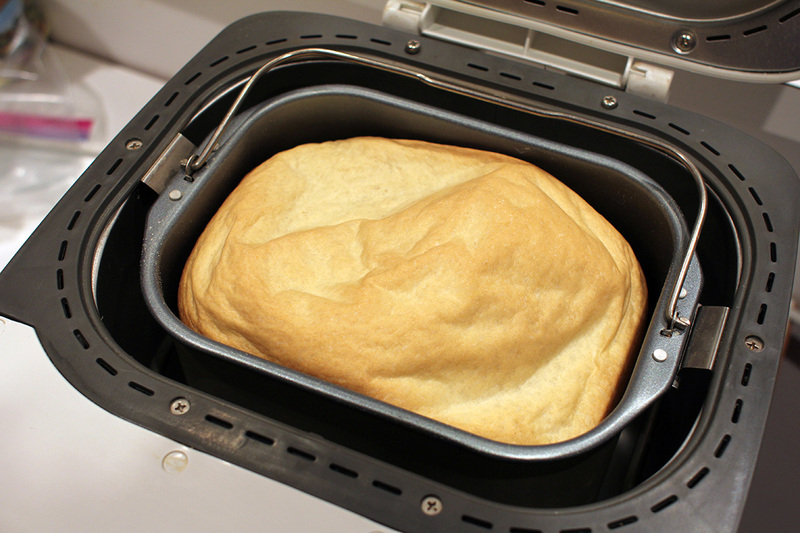 bake on basic setting with bread machine (3 hours). 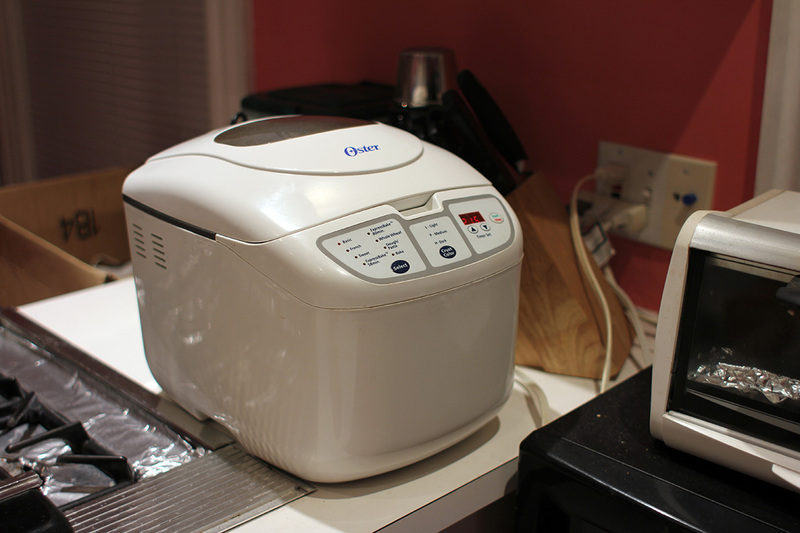 but tonight i was bringing back the bread machine, after more than a decade hiatus. i was hoping i could also show sandy the machine in action. one important thing i forgot was just how long it takes to make a loaf of bread: 3 hours, with the kneading and rising and kneading and baking. there's an option for express bake bread that'd just take 60-80 minutes, but i felt those kind of breads would be inferior to one that was more naturally made. the recipe i used was the one from the manual. it wasn't until almost 6:30pm did i start combining the bread ingredients. that meant i wouldn't be able to eat my bread until 9:30pm at the earliest. i'm not sure how i did it in the past, but i used warm water this time around, with the optimal temperature as measured by my infrared thermometer. once all the ingredients were in the pan, i inserted it back into the machine and turned it on. 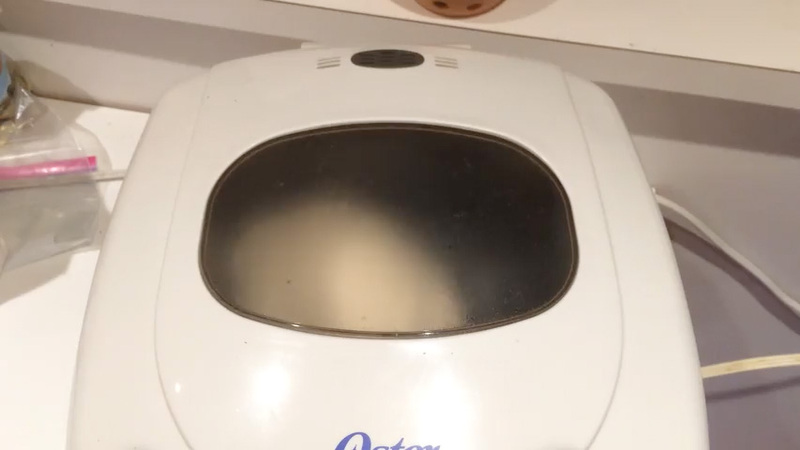 i heard the familiar "whirr-whirr" sound of the bread paddle working its automated bread making magic. sandy came home just in time to see it kneading the dough. 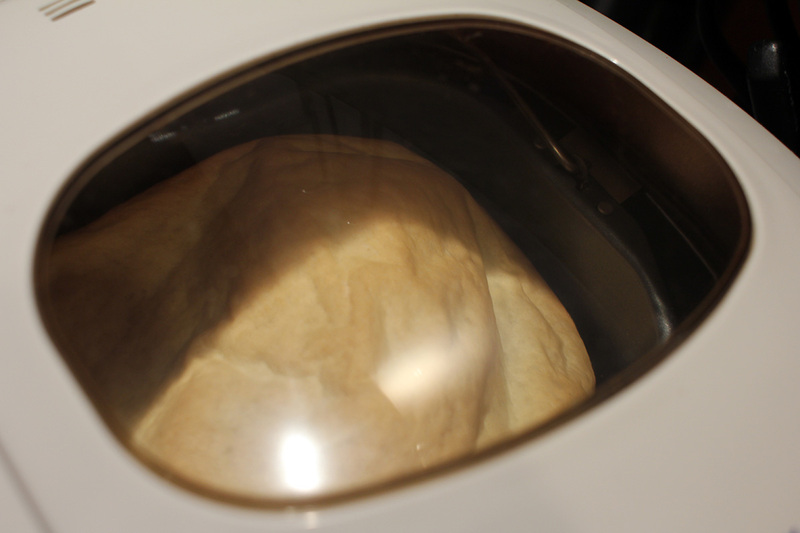 besides the noisy paddle beating against the dough, the bread machine experience is also about the yeasty bread rising smell that permeates the house, like being inside a brewery. i had to move the machine onto the counter because it was shaking the tabletop so violently i though the table would break. after about the 2 hour mark, the bread had risen into a majestic dough, the largest one i've ever seen. unfortunately that was all a tease because an hour later - about when the bread was almost finished - the loaf had deflated. when the bread was finally finished (machine beeps), sandy and i went to the kitchen for the unveiling. i dumped it out of the pan onto a cooling rack. 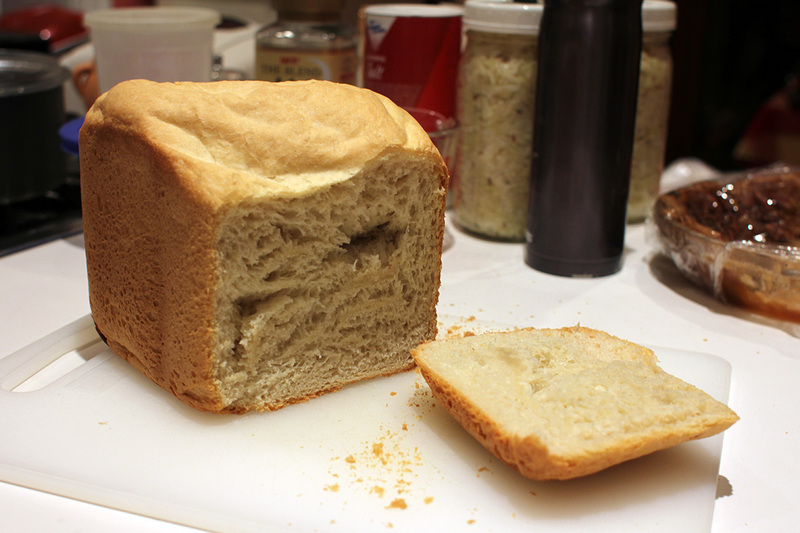 the bread was a hard cube, not particularly appetizing. 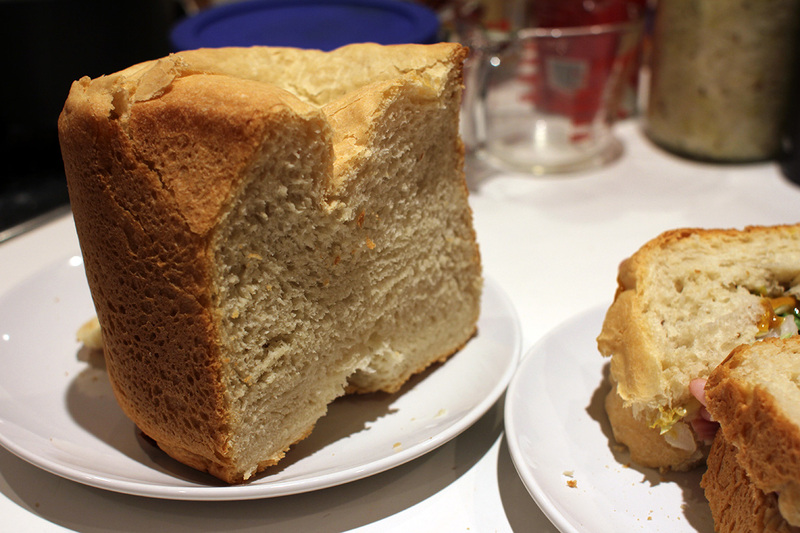 only when i cut into it did it reveal the soft bready interior, hot with steam. i cut some small pieces to try first. nothing special, but it tasted like bread, with a very crunchy crust and a very soft interior. 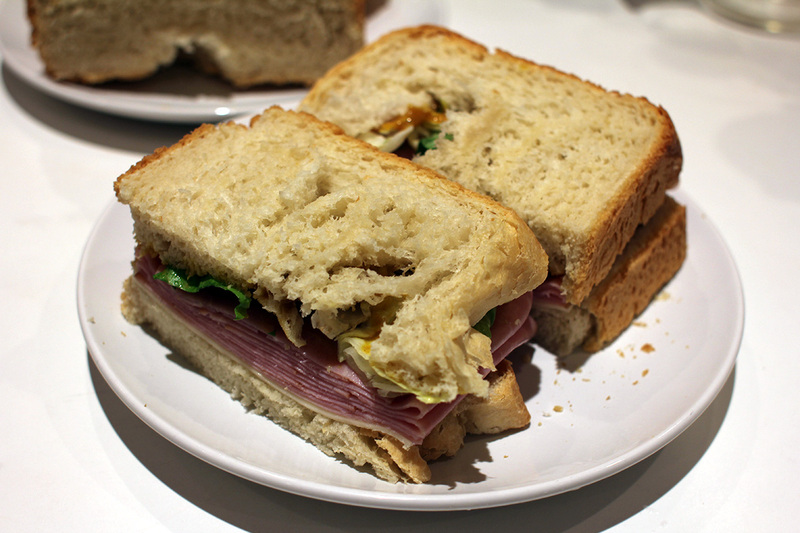 i made myself a ham & cheese sandwich (i was very much starving by that point). sandy said she didn't any, but i talked her into having one and made her half a sandwich. it was okay, but the was a little too hard and crunchy and hurt my mouth. i discovered the ABC comedy single parents more than a week ago. i caught bits and pieces a few times on air, had some laughs, but was never motivated to track down the show until now, especially with youtube tv and how it has all the episodes from this first season. 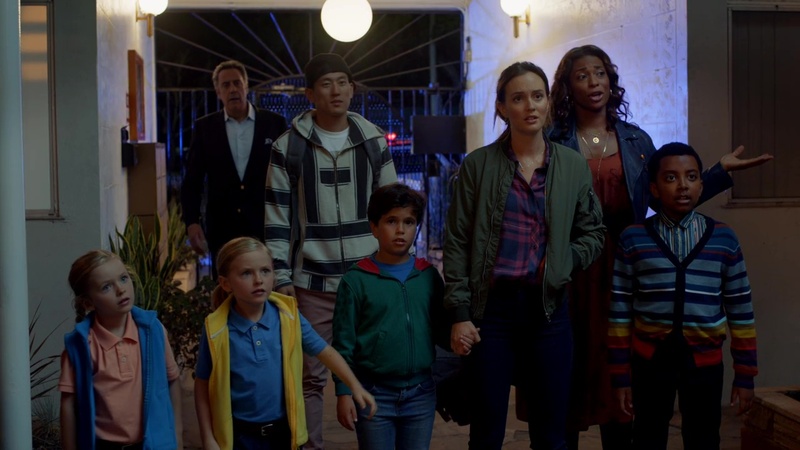 on paper this would never be a show i'd watch, with an unlikely ensemble cast consisting of taran killam (of SNL fame, though i was never a fan), leighton meester (gossip girls), brad garrett (everybody loves raymond), kimrie lewis-davis (token black woman), and jake choi (token asian man). the premise is even less attractive, about the daily tribulations of a group of single parents and their children. but watch a few episodes and the show really grows on you. and it's genuinely funny too, not in that low hanging fruit typical of sitcoms, but contemporary humor, the kind you'd have with your friends. and the music! it's like somebody peeked at my playlists from the 80's and 90's: erasure 'a little respect,' alanis morissette 'you learn,' wayne newton 'danke schoen,' public image ltd 'rise.' the kids are also great: my favorite is graham, the antsy son of angie d'amato (meester). 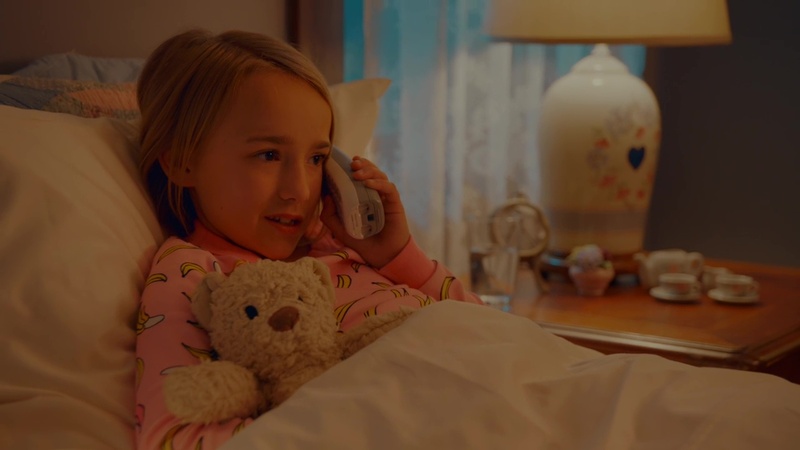 there's also rory, the flamboyant 8-year old son of poppy banks (lewis-davis), who seems to much hated amongst the online community for his precocious beyond his 8-year old age, in a similar mold to stewie from family guy. 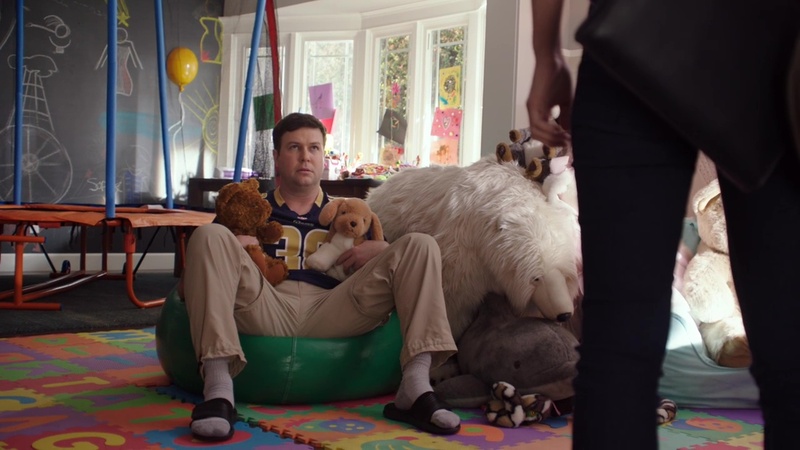 the show also has heart, and it's apparent now that the world of single parenthood is rich with comedy gold. the best part is for whatever reason when i watch it streaming from youtube tv on my computer, there are no commercials! i think it's because i have an ad-blocking extension and google/youtube hasn't caught on yet that it will successfully prevent the commercials from showing up (how this is not the case when i watch it on my phone or even stream it through chromecast). 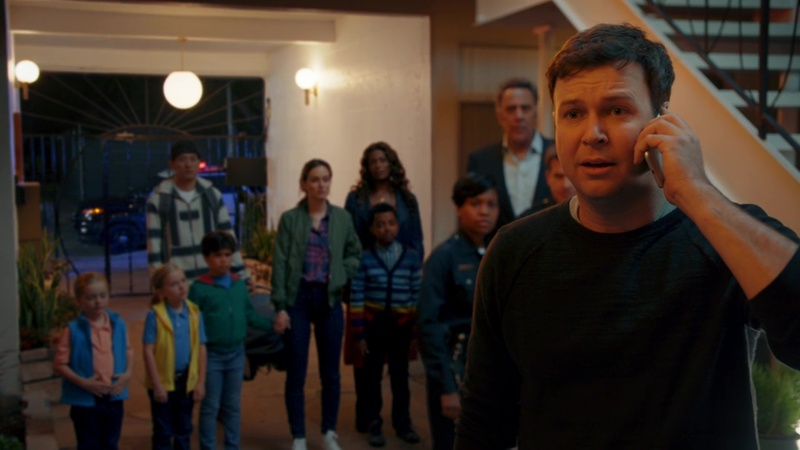 i haven't watched an ABC comedy show this funny since happy endings, and for a while i even though maybe it was produced by the same showrunners (it's not). i really hope ABC doesn't cancel it but in the meantime i still have plenty of episodes i haven't watched yet.